The obscuration believed to be responsible for the observed differences between Seyfert classes is postulated to have the approximate geometry of a torus, Fig. 5. This is rich in molecules which are protected from the extreme environmental conditions by the high density of dust present; sufficient to be opaque to the hard X-rays which are observed in type 1 (but not type 2) Seyferts (Lawrence & Elvis 1982). Due to evaporation of the dust, the inner edge of the torus is located at a distance of a few parsecs from the continuum source (Krolik & Begelman 1986; Krolik & Begelman 1988) and heated to temperatures ~ 104 K. The average column density of the torus is 1024 cm-2 (Krolik & Begelman 1988), which is Compton-thick to the X-rays; the gas is densest within the inner regions (Krolik & Begelman 1986) and more diffuse toward the outer regions of the torus (Pier & Krolik 1993). 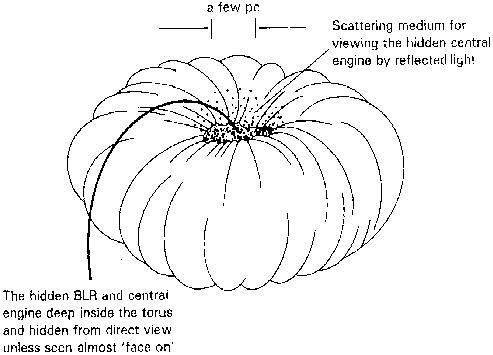 Since the high random velocities (~ 100 km s-1) measured within the torus would imply a correspondingly high thermal temperature which is destructive to dust, the torus is conjectured to be comprised of randomly moving high-density clouds (in which dust and molecules are always found to coexist). As well as holding the clouds in a toroidal structure, collisions between the clouds cause frictional heating which swells the torus: The clouds which lose sufficient angular momentum through this process are captured by the black hole, thus supplying it with the necessary sustenance (Krolik & Begelman 1988; Tacconi et al. 1994). As mentioned previously, the torus itself is hypothesised to be fed by incoming atomic gas from kpc scales (Shlosman, Begelman & Frank 1990; Friedli & Martinet 1993; Shaw et al. 1993; Wilson & Tsvetanov 1994; Maiolino & Rieke 1995) and the amount of material ultimately available to cause obscuration may depend on the amount of star forming activity (Maiolino et al. 1995). Figure 5. 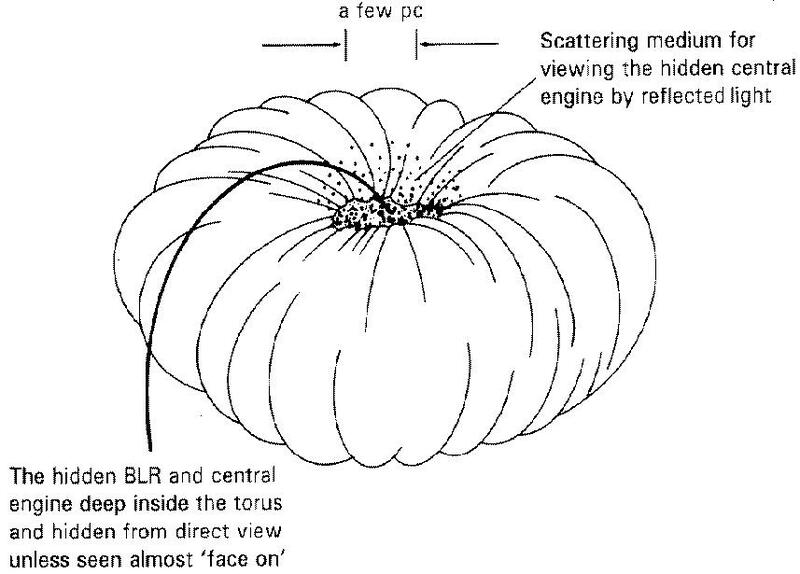 A schematic drawing of an obscuring torus. The torus must be geometrically thick (height/radius 1, Krolik & Begelman 1988; Tacconi et al. 1994) in order to obscure the Seyfert nucleus over the necessary range of viewing angles and allow the broad line region to be viewed only through reflections from its inner face. Taken from Robson (1996), courtesy of Ian Robson. Figure 6. The warped circumnuclear disk in NGC 4258. In this model high pressures permit the existence of molecules close to the AGN, where the obscuring and masing occur. As the pressure falls the gas becomes atomic and, when the temperatures become sufficiently low, the gas will recombine, giving the larger scale molecular ring; extending to ~ 600 pc in this galaxy (Plante et al. 1991). Taken from Neufeld & Maloney (1995), courtesy of David Neufeld. CO 2 -> 1 observations of five nearby Seyferts suggest that the bulk molecular gas is distributed in a ~ 400 pc radius ring/disk, which sustains the smaller scale molecular torus/accretion disk (Baker & Scoville 1998). Feeding from the ring to the nucleus could occur along the smaller scale (length ~ 1 kpc, i.e. 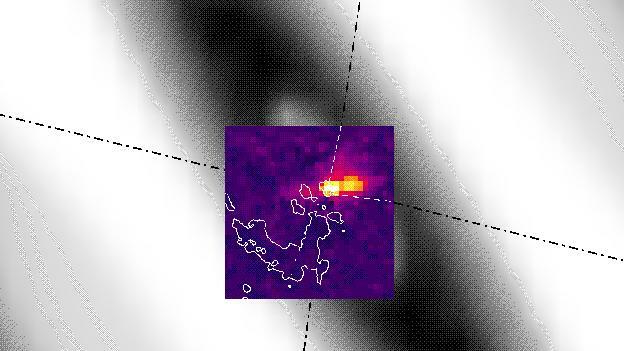 within the ring) nuclear bar known to exist in some galaxies (Devereux, Kenney & Young 1992; Freeman 1996) (35), and such a bar may now have been detected in near infra-red in Circinus by Alonso-Herrerom, Maiolino & Quillen (1998), Fig. 7. Since the molecular ring encloses the nuclear bar, a diameter similar to the bar length is expected; some examples, of the (type 2) Seyfert galaxies known to contain molecular rings (36) in addition to H2O maser emission, are shown in Table 1. Of these, NGC 1068 (Schild, Tresch-Fienberg & Huchra 1985; Ichikawa et al. 1987; Neff et al. 1994), NGC 3079 (Baan & Irwin 1995, and references therein), NGC 4945 (Moorwood & Glass 1984; Moorwood & Oliva 1994; Nakai et al. 1995; Moorwood et al. 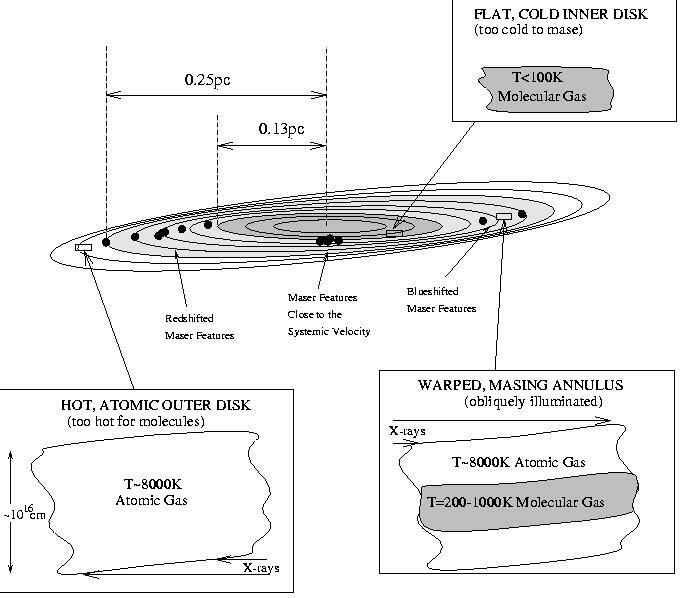 1996b) and the Circinus galaxy (Moorwood & Glass 1984; Marconi et al. 1994) are currently experiencing vigorous star-formation activity. Table 1. The type 2 Seyfert galaxies, mentioned in Section 2.1, in which molecular rings have been observed. Note that, due to their close proximity, the results for NGC 4945 and Circinus are from single dish observations. The remainder are from higher resolution interferometric observations. *These values of outer radii apply to the dense molecular component in NGC 3079 and Circinus (in both cases the less dense components extend to ~ 2 kpc, Israel et al. 1998; Curran et al. 2000b, Appendix D), thus giving the molecular rings in these two galaxies very similar dimensions. Figure 7. The possible nuclear bar of Alonso-Herrero, Maiolino & Quillen (1998), scaled and superimposed the molecular ring of Curran et al. (1998). If the bar shares the same inclination as the ring, the inner segment has a length of 250 pc and the trailing segment (which sweeps back from the direction of ring rotation, Fig. 9) extends out to around 500 pc, i.e. near the outer edge of the dense ring (Curran et al. 1998). Also, the NW portion of the bar may be obscured by the ionisation/molecular outflow. It should be noted that the white broken lines have been added by Alonso-Herrero, Maiolino & Quillen (1998) in order to show the location of the ionisation cone (Section 4) and the black broken lines show the opening angle of the molecular outflow (Curran et al. 1999), Fig. 9. Molecular rings have also been found in the star-burst galaxies NGC 253 (Koribalski 1996)*, NGC 660 (Gottesman & Mahon 1990), NGC 1365*, NGC 1808 (Véron-Cetty & Véon 1985)*, M82 (Weliachew, Fomalont & Greisen 1984; Yun 1992), NGC 3828 (Schmelz, Baan & Haschick 1987), (possibly) NGC 6221 (Koribalski 1996)*, NGC 7469 (Genzel et al. 1995; Glass 1998)* and NGC 7582 (Morris et al. 1985)*. The majority (those marked thus*), although classified as star-burst galaxies, also exhibit Seyfert characteristics, thus reaffirming the notion that there may be a gradual evolution from one class to the next. It is perhaps worth mentioning that similar molecular rings (300 r 800 pc) are also observed in ultraluminous infra-red galaxies (Downes & Solomon 1998; Genzel et al. 1998). These galaxies are so bright in the far-IR (Soifer et al. 1984), that they are believed to host an AGN (possibly a quasar, Sanders et al. 1998) in addition to an extreme star-burst (37), supplied by 109 M of molecular gas (Sanders et al. 1986; Downes & Solomon 1998; Genzel et al. 1998), although unlike Seyfert galaxies, the majority of the far infra-red radiation appears to be due to star formation rather than an AGN (e.g. Solomon, Downes & Radford 1992). The interested reader is referred to Curran, Aalto & Booth (2000) where this matter is further discussed. 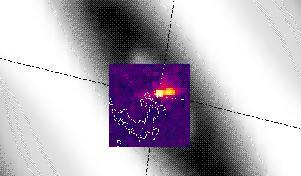 In Circinus, IR observations (Davies et al. 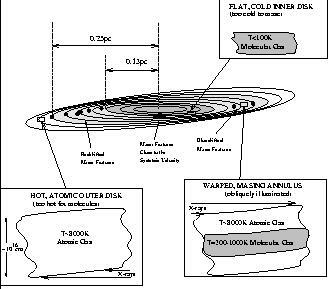 1998) reveal that the star formation (38) is occurring within the molecular ring (Fig. 12). This is located close to the inner edge of the HI ring, which is fed by the bar of atomic gas extending to 10 kpc (Jones et al. 1999). The authors assume the inclination of the HI ring to be similar to that of the ring of ionised gas (39) (Elmouttie et al. 1998c, Fig. 12 [c]), giving the HI a rotational velocity of 200 km s-1 at 1 kpc, c.f. 350 km s-1 and 220 pc for the ionised gas ring. If, however, the HI is inclined (40) close to the molecular ring (the HI ring on scales of ~ 1 kpc is not resolved although the inner disk/bar has an inclination of 70°, Fig. 12 [a]), then the velocity obtained is 140 km s-1 which matches well with the 150 km s-1 found for the CO ring at 600 pc (41) (Curran et al. 1998l Jones et al. 1999). 34 Research Paper A. Back. 35 Although recent observations suggest that nuclear bars are not so common in Seyfert galaxies and that nuclear spirals are responsible for funnelling the gas, via shocks, to the central engine (Regan & Mulchaey 1999; Martin & Pogge 1999). Back. 36 Molecular rings may in fact exist in all spiral galaxies (Sofue 1991), including our own (Güsten 1989). Back. 37 With ages of between 107 yr and 108 yr (Genzel et al. 1998) these star-bursts are slightly older than those in standard star-bust galaxies (previous section). Back. 38 The IR/H2O luminosity ratio is comparable with the mean Galactic value, and since Circinus has a much higher H2O maser luminosity (Gardner & Whiteoak 1982), this implies that Circinus has a correspondingly high level of star-burst activity (Moorwood & Glass 1984). A high star formation efficiency is also confirmed by Marconi et al. (1994); Elmouttie, Haynes & Jones (1997); Elmouttie et al. (1998a), although Curran et al. (2000a) find that not all of the IR radiation necessarily arises from the star-burst activity. Back. 39 A survey of isolated Seyfert galaxies shows large [NII]/[H ] and [SII]/[H ] ratios (especially in Sy2s) which suggests that the ionised gas is arranged in clouds around the nucleus (Pogge 1989). This is confirmed in Circinus by Moorwood & Oliva (1990). Back. 40 Like Circinus, a warp in the HI disk of NGC 5033 is observed by Thean et al (1997). Back. 41 The CO extends well beyond this (Appendix D) but this is the limit of our closely spaced map. Back.